A Jefferson County Schools bus drives off the lot. The district near Denver increased its transportation of students placed in foster care across district boundaries as a result of a law passed last year. 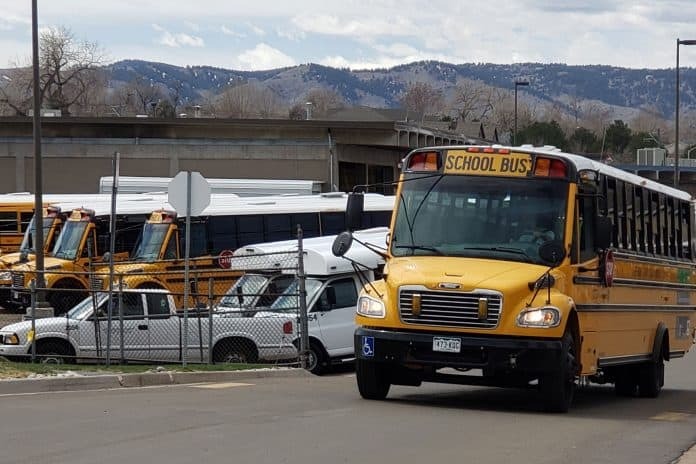 Colorado officially repealed a sneaky piece of legislation that attempted to crack open transportation between school districts last year. Still, the question of how to lessen barriers between students and a quality education remains to be solved on a case by case basis. One solution aiming to open up inter-district transportation as a component of school choice was tacked onto the end of another bill last year. The 2018 “Improving Educational Stability For Foster Youth” bill focused on ensuring children in the foster care system had reliable transportation to their schools of origin, should their foster home move them over district lines—and the open inter-district provision in Section 7 stuck out like a sore thumb. Before signing the bill into law, then-Gov. John Hickenlooper cited “extraneous language” that had no apparent connection to foster children. He also pointed out that Section 7 mirrored a different bill that had been postponed indefinitely the day before. When several school districts sued the state last August, arguing this legislative hitchhiker violated the Single-Subject bill provision in the state constitution, the court found in their favor. Senate Bill 19-39 signed by current Gov. Jared Polis on March 8 solidified that decision in law. “If you want to run an inter-district transportation bill you can, but you can’t call it ‘foster care transportation,’” explained Dr. Jason Glass, superintendent of Jefferson County Public Schools, a plaintiff in the case. Under the 2015 Every Student Succeeds Act, transportation is guaranteed for students in the foster care system who are moved outside of their original district. Before the most recent foster care bill, JeffCo transported two students over district lines. This year, it transported 11 children in foster care across district lines, mostly by adding to existing bus routes, but also by contracting American Logistics Company to accommodate one student with special needs. Still the separate issue of transporting all students to their school of choice remains to be discussed. Glass added that the open inter-district transportation legislation in Section 7, which would have allowed any district to pick up any student regardless of location, would have come with unintended consequences. Proponents of open transportation between districts counter argue that it would create greater equity for students. “We are trying to address equity in access to transportation,” said Matt Samuelson, resident lawyer for the Donnell-Kay Foundation. Samuelson testified in opposition to the inter-district transportation repeal before the Senate education committee earlier this year because he said he perceives any opportunity that opens access to transportation as a step forward. In addition to inter-district busing, Samuelson said he wants to see more districts leverage ride-share services and public transportation options. “I think there are conversations that should focus on the students’ difficulties rather than on the adult problems around transportation. I think the adult problems are legitimate, but it mostly comes down to dollars,” Samuelson added. Others said it’s not the budget lines that make inter-district transportation difficult so much as the manpower. “I can’t say that funding is it as much as the staffing, just because there’s so many shortages everywhere it’s a matter of who’s going to drive this bus,” said Theresa Anderson, who has consulted with school transportation districts for nearly a decade. Anderson previously ran transportation for both JeffCo and Cherry Creek Schools and said both districts collaborated with neighboring districts to get kids to school. Editor’s note: The article has been updated to reflect that the new law repeals only the inter-district transportation option in Section 7 of existing law passed last year.